Underwater Archaeology, as its name suggests, would be the archaeology which takes place underwater. So, why exactly should we bother with Underwater Archaeology? Simply put, that’s where the answers are. All of them. The Yonaguni Monument, 30 meters underwater, Japan. Source. For anyone that questions current accepted model of human history; for anyone that thinks that intelligent civilizations have existed long before us; for all of the OOPARTS that contradict everything we think we know—the answers are all around us. Literally. Right off the coast. We are taught that we first entered the Neolithic Era at approximately 10,000 BC. The Neolithic Era describes the period where humans began transitioning from hunter-gatherer-wanderer communities to more stable settlements, agriculture, and domesticated animals. In essence, this is when the first cities began. Assuming the traditional model of human evolution, the first homo sapiens emerged approximately 200,000 years ago. This is disregarding previous ‘homo’ species, which actually already had fire and stone tools for tens of thousands of years before homo sapiens evolved. An Ultra-brief Human History Timeline. The point of this is that 10,000 BC isn’t when humans began to build cities. It’s when humans began to build cities again. Zero to the moon in 10,000 years flat? Clearly doable. But, 188,000 years to do absolutely nothing? Debatable. But, if there were previous civilizations that were as advanced as us, shouldn’t there be proof? Well, that brings me to my next point. 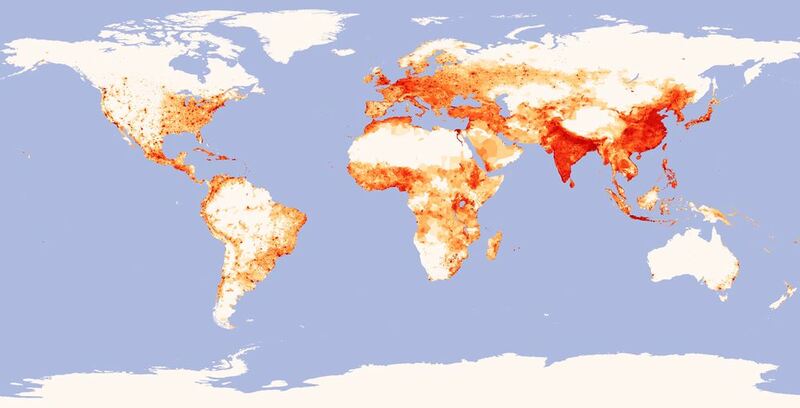 Below, you’ll see a current map of the world which is colored based on population density. As you can see, dense populations tend to thrive along the coast. This is for multiple reasons, such as fishing, trade, and pleasant sea breeze. All that is beside the point though. The image speaks for itself. The world, by population density. Source. In this next image, you will see a map of the world during the last ice age. In case you are new to this topic, large amounts of ice would mean less water in the ocean. This would also mean more land, extending most of our coastlines further than they are now. An Ice Age world map. Source. There are two main things to note about this image. The first would be the coastlines. You may notice a much larger South America. Furthermore, the scattered islands of Indonesia and the Philippines (which are presently over 20,000 different islands,) are joined as two main land masses: Sahul and Sundaland. The next point to note would be the fact that much of present day North America and Europe are covered in ice. This would make them as uninhabitable as Antarctica is today. 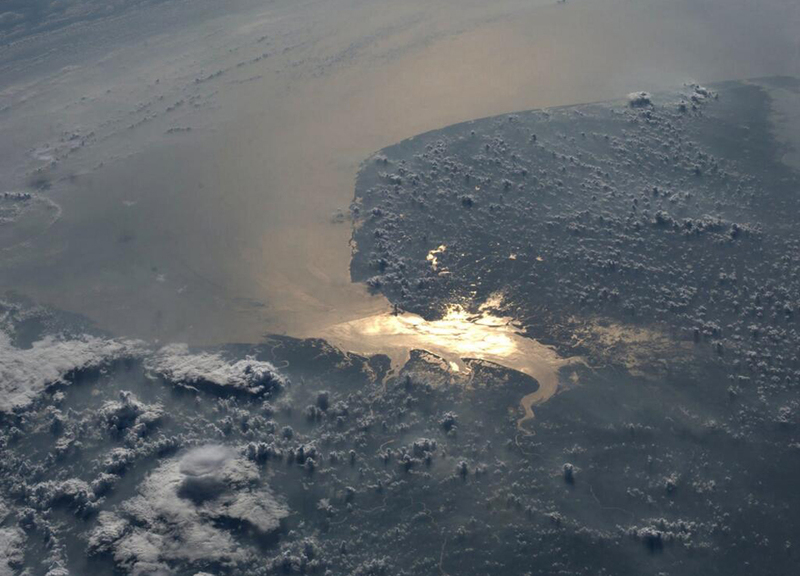 Rising Sea Levels – What does it mean for us? This next image shows a “before and after” of our last Ice Age. The areas in green being our current land, and the areas in brown representing previous land that is now submerged. In case it’s still vague what I’m getting at, get this: Presently, a billion people live within 20 meters of sea level. One billion. BILLION. In other words, should the sea levels rise by 20 meters, a billion people will find themselves underwater. So what happens if sea levels rise by 50 meters? Or 100 meters? The last Ice Age ended about 11,700 years ago. This basically meant large amounts of melting ice, and ocean levels rising by approximately 100 meters. If there was an advanced civilization before us: Atlantis, Lemuria, Mu. Well, now you know where they are. Maybe it wasn’t a complete fairy tale to say that they were swallowed by the sea. On a side note, note the date: Maybe it isn’t such a coincidence that our “first cities” began just 10,000 years ago. 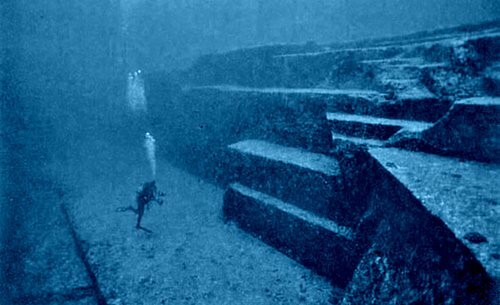 The Yonaguni Monument, 30 Meters underwater, off the coast of Japan. Source. The sun shines on the Gulf of Cambay, India. Source. Geometric features have been discovered off coast of Gujarat in west India, between 20 – 40 meters underwater. The site contains granaries, baths, and a drainage system, plus thousands of artifacts such as jewelry, stone tools and pottery. 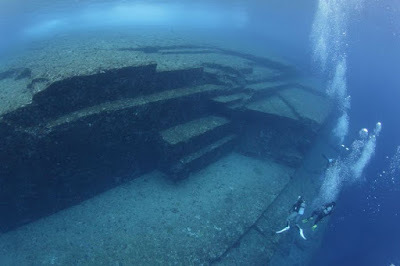 Similar to the Yonaguni Monument, these could only have been built during the last Ice. So many underwater structures have been discovered, including the outrageously old Rama Bridge and the Pyramid at the center of the Bermuda Triangle. If these things are truly man-made, it very literally changes everything we think we know. We don’t know much about our underwater pre-history at the moment, but for the ones that we do find, it means a lot more than we think. It’s not whether or not the stories of Atlantis were true. In fact, forget Atlantis. That is not the point here. The point is that history did not start 12,000 years ago. It restarted 12,000 years ago. Evidence of that is all around us. Just off the coast.